Quiet bear Dream Mischa Tebs's confidence is growing thanks to the move to a new enclosure with lots of opportunities for exploring. 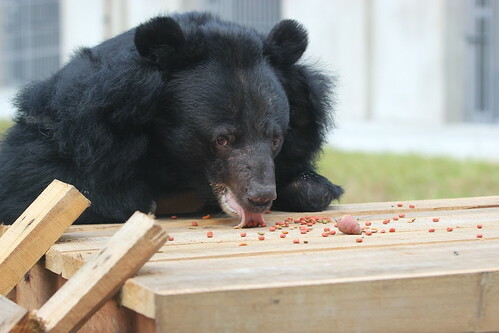 As the 100th bear rescued by our Vietnam sanctuary – she's a very special bear indeed. When she was rescued from a bear bile farm in Binh Duong province, staff were shocked to see the disabilities she was living with. Her left fore paw was completely missing – most likely from being caught in a hunter's snare – while her right fore leg had a severe injury to the wrist fusing the joint in a permanently flexed position. "Bears rely heavily on their front paws for eating, playing, climbing, building nests and of course walking, so it is really sad to see a bear with no function in either paw. 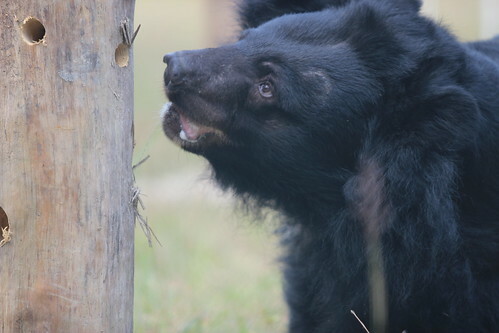 When she arrived, Dream Mischa Tebs also had nine fractured and rotten teeth removed and was suffering from a haemorrhage in her left eye – she was a very damaged bear." Perhaps because of her injuries and traumatic past, Dream Mischa Tebs has always been a rather timid and inactive bear – spending most of her time nesting and sleeping. 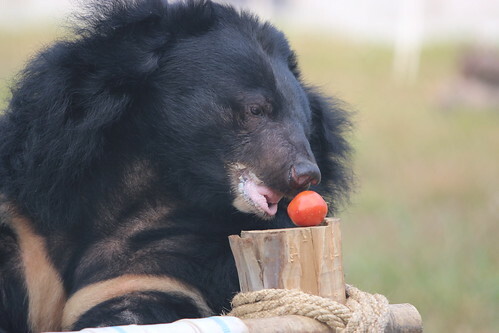 "Dream Mischa Tebs is a very special bear to all of us here in the sanctuary. She requires extra care and attention, but she deserves every bit of it after what she's been through. "It will take a bit more time until she's completely comfortable in her new home but it is wonderful to see her being challenged by her new environment. We have no doubt the new change will do wonders for her and her on-going rehabilitation." Have a great #moonbearmonday everyone.